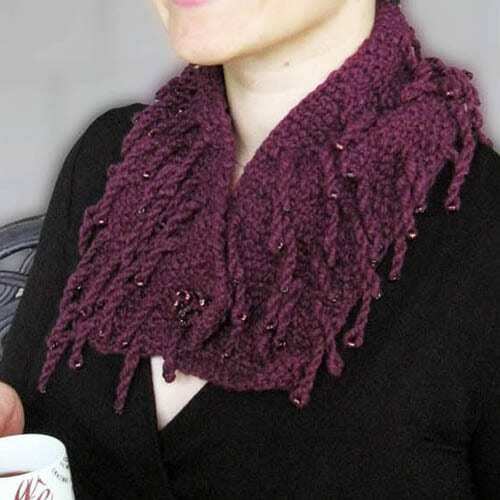 Truly unique with tendrils and beads, this stylish cowl transitions from fall through winter. Whether for a night on the town, lunch with the girls, or cozying up by the fire, City Girl Cowl will keep you warm and fashion forward. Tech edited by Katherine Vaughan, this advanced beginner level pattern includes written directions, charted directions, a diagram, and pictures. Two you tube videos also demonstrate how to make tendrils using the method in the pattern and how to make the custom beaded button. 26″/ 66cm long by 5″/ 12.5cm wide. Makes a great gift! 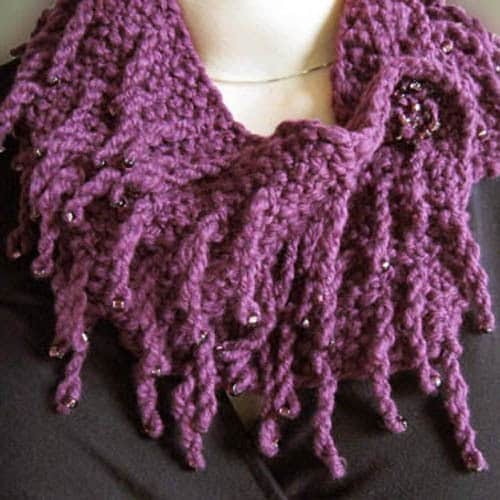 You can go classic and refined with rich monochromatic tones or wild and funky with rainbow yarn and glitzy beads.